I find that the more books I read, the more historical things I realize I don't know that much about. I know the bare basics of the War of 1812, but as it's not really discussed much, the basics are about all I know. This book has awakened a curiosity to learn more about that time period. I love that Abigail was such a strong character, while still being vulnerable and accepting help when she needed it. It's a fine line between being unable to do anything for yourself and not letting anyone do anything for you. The author nailed it in this story. I did feel like the relationship between Abigail and Emmett happened really fast, and it kind of bugged me for a little bit, until I got further in the story and realized how the relationship happened wasn't the main focus of this book. I thought all the characters were well-developed and I either loved them or hated them. :-) I kinda have to wonder if there will be a sequel to this story, because it felt like there were some loose ends, especially with Abigail's father and brother. 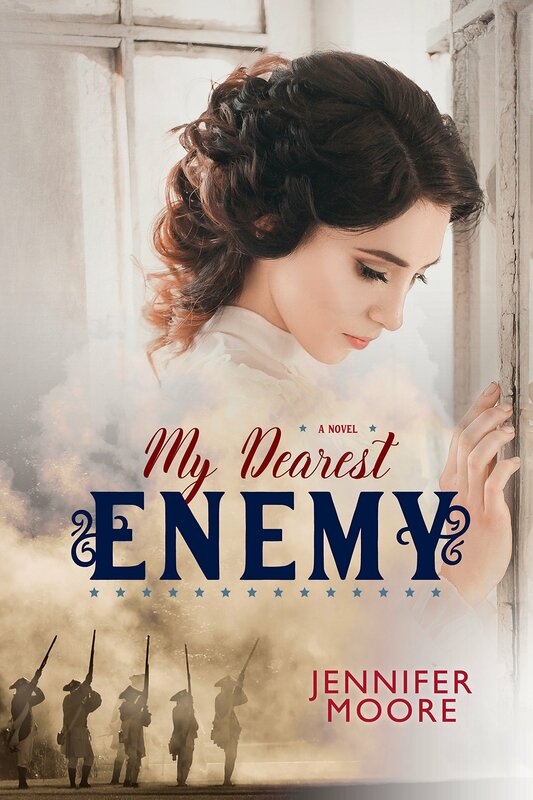 I'm a fan of Jennifer Moore's books, so I was excited for the opportunity to read My Dearest Enemy. This is a pretty short novel (less than 200 pages), and I thought I would read it very quickly. Sadly, I had a lot on my plate when it arrived and I had to read little bits here and there over several days. The story was enjoyable, so I like to think that, given more free time, it would be a fast read. I was intrigued by Abigail and her situation right off. It was a little surprising that she was left on her own while her father and brother were gone with war responsibilities. Maybe it is just naive of me to think that women weren't left alone during war, but given the time period, I didn't think too many would have been thought capable of being alone. It seemed like they would have been sent to live with extended family or friends. But, regardless of what was or wasn't typically done, Abigail showed right off that she was very capable of handling herself, her household, and random injured enemy soldiers. History was one of my favorite subjects, but I'm embarrassed to admit that I was at a loss to figure out what war was happening in this story. The blurb on the back of the book clued me in to the year (1812), but even then I couldn't remember any details about the War of 1812. It looks like I need to brush up on my wars. In some ways, I felt the beginning of the story was stronger than the middle and end, but I did like it. The characters were well developed, and it had a happy ending. While I was thoroughly entertained with this story, I left it feeling like it wasn't done, or complete. It wasn't quite a novella, but it didn't quite seem like a full length novel either. Everything just happened really fast, especially the romance. Although, I will admit I didn't mind that. My problem was actually how she changed her mind super fast about the soldiers and her allegiance. While I'm glad she was able to see the soliders as men, I just think it would have been a little harder to get there, especially if your own dad and brother were fighting on the other side. But that conflict never really was brought up, and well, it bothered me. I enjoyed both Emmett and Abigail, but I enjoyed the soldier friends even more. I would have liked to hear more from each of them. Actually, I would have just enjoyed more story period. But if you need a quick sweet romance, this is a good one.